This article is about the city of Basse-Terre. For the island on which the city is located, see Basse-Terre Island. Not to be confused with Basseterre, St. Kitts and Nevis. Basse-Terre (French pronunciation: ​[bɑstɛʁ]) is a French commune in the Guadaloupe department of France in the Lesser Antilles. It is also the prefecture (capital city) of Guadeloupe. The city of Basse-Terre is located on Basse-Terre Island, the western half of Guadeloupe. Although it is the administrative capital, Basse-Terre is only the second largest city in Guadeloupe behind Pointe-à-Pitre. Together with its urban area it had 44,864 inhabitants in 2012 (11,534 of whom lived in the city of Basse-Terre proper). The N1 which exits the commune in the south on the coast and continues inland to Gourbeyre then all the way around the coast to Pointe-à-Pitre on Grande-Terre. The N2 which goes north along the coast to Vieux Habitants and continues all the way around the coast to join the N1 at Baie Mahault. The N3 which traverses the length of the commune and continues to Saint-Claude inland. Basse-Terre has a maritime station that receives cruise ships and has a ferry service to the Îles des Saintes. The commune is mostly urban with some farmland in the north-east and north-west. The different districts of Basse-Terre are: Agincourt (also Saint-Claude), Bas-du-Bourg, Carmel, Desmarais (also Saint-Claude) Guillaud, Morne-Chaulet, Morne-à-Vaches (also Saint-Claude ), Petit-Paris, Pintade, Rivière-des-Peres, La Rue-Maillan, Saint-François, Sur-le Morne, and Versailles. A list of online mapping systems can be displayed by clicking on the coordinates (latitude and longitude) in the top right hand corner of this article. Basse-Terre lies at a transitional point between a tropical rainforest climate and a tropical monsoon climate. While Basse-Terre does feature a drier stretch from January through March, the town does not quite have a dry season month. The town’s driest month (February) sees on average roughly 60 mm of precipitation. A monthly precipitation average below 60 mm is considered dry season month. As is the norm with cities with these two climate types, Basse-Terre features relatively consistent temperatures throughout the year. The name comes from the mariners' vocabulary of the 17th century which designated a land or coast sheltered from the wind, as opposed to Capesterre "Cape to the east of Land". Before Basse-Terre became a French town it was a village of American Indian horticulturists and potters. The village was on the site of the present Basse-Terre Cathedral where archaeological excavations found human remains and other evidence of occupation during the restoration of the cathedral. In 2005 on the lower part of a Native American garbage dump, excavations have uncovered a new dump containing large amounts of archaeological material: food waste, ceramics, stone tools and shell tools, ornaments, charcoal and a tomb. 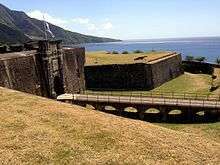 In 1635, when it was part of Saint Kitts and Nevis, an expedition was seeking a place of lasting presence in Guadeloupe. The operation was entrusted to Charles Liénard de l'Olive and Jean du Plessis d'Ossonville together with 4 missionaries and 550 colonists. The landing took place on 28 June 1635, at Pointe Allègre, far from Basse-Terre. Famine pushed the party to the south near the present town of Vieux-Fort in early 1636. The relationship between Native Americans and colonists degraded quickly; Liénard then began a bloody war against the locals. In 1660 a treaty forced him to retreat to Dominica and Saint Vincent. The war forced him to build a fort, today Fort Olive at Vieux Fort. In 1640 Aubert succeeded Liénard as the government of the island and he soon left the site to settle on the left bank of the Galion, which is the current Gourbeyre marina. In 1643 Charles Houël du Petit Pré replaced Aubert and, in 1649, he left the marina site for the right bank of the Galion and built a fort. Some religious built the first church, now the Church of Our Lady of Mount Carmel, shortly afterwards and the city was organized around the chapel and from the fort to the river of Herbs. This was the beginning of Basse-Terre. Around 1680 on the right bank of the river of Herbs the Capuchins build a chapel dedicated to Saint Francis of Assisi where the present Guadaloupe Cathedral is located and a second centre of population grew around this place of worship. The River of Herbs separated the two distinct villages: Basse-Terre and Saint Francis. In reality, people flocked to the new town because of attacks by the English who burned the town of Basse-Terre in 1691 and again in 1703. Following these raids the people thought that the fort was attracting the invaders and consequently moved to Saint Francis. A stone bridge was built in 1739 replacing a ford and a wooden bridge across the river of Herbs. On 23 January 1759 the island was taken over by the British who devastated the island. The island was occupied by the British until 10 February 1763. The colony was experiencing a resurgence of activity despite the founding of Pointe-à-Pitre in 1764 - a town in a better position for the ocean swell - and despite a fire in September 1782. The town was partially redesigned around 1787. The French Revolution reached the island and therefore Basse-Terre in September 1789. The English passed the town to Governor Collot and Victor Hugues on 22 April 1789. Colot and Hugues were sent by the National Convention in Paris to take the colony in hand and abolish slavery. They dislodged the cannon in December 1794 and installed a guillotine. The city was the scene of military operations conducted by General Richepanse, who was sent by Napoleon to reestablish slavery, against Louis Delgrès in 1802. Delgrès retreated to the fort on 20 May 1802 and abandoned it on 22 May. The town was occupied from 6 February 1810 to 30 May 1814 and again from 10 August 1815 to July 1816. For over 20 years Basse-Terre suffered from the effects of these disturbances. Only after four hurricanes (in 1816, 1821, 1825, and 1844) did Basse-Terre think of rehabilitating the construction and development of the Champ d'Arbaud by building a Military Hospital (now Gerville-Réache High School), a bishopric, sanitation, and expansion of the city by creating new neighbourhoods such as Trianon, Versailles, Petite Guinée, and Petit-Paris but the situation remained unchanged, worsened more by a cholera epidemic in 1865. From 1870 the commune began to recover and inaugurated its town hall in 1899. It was the first city in Guadaloupe to be electrified in 1913. The impetus came from Ali Tur, who arrived after the cyclone of September 1928 and built the courthouse, the General Council, and a market in the 1930s. A port was built (as wooden quays had previously served as a port) from 1961 to 1964, the boulevard was built in 1962 to serve the port: it was extended in 1964 and again in 1965 along what was once a pebble and black sand beach that ran along the coast. On 26 November, 1970, 1.5 inches of rain (38.1 mm)fell in a minute, the heaviest ever recorded. Cyclonic conditions repeatedly ravaged the development of this boulevard in 1989 with Hurricane Hugo and Hurricane Marilyn in 1995, Hurricane Lenny in 1999, and Hurricane Omar in 2008. In 1976 73,600 inhabitants of the town were evacuated (from 15 August to 18 November 1976) due to the high activity of the Soufrière volcano. Some evacuees never returned and moved to Jarry. For 20 years, the town centre was depopulated in favour of peri-urban areas or neighbouring towns such Baillif, Saint-Claude, and Gourbeyre despite attempts at renewal. The fleur-de-lis symbolise the belonging to France while sun symbolises a tropical island. Gules, charged with a sun of Or; in chief Azure 3 fleurs-de-lis Or. The commune of Basse-Terre has a Courthouse, which was built in 1934 by architect Ali Georges-Tur, and which also houses the Basse-Terre Court of Appeal, a Tribunal d'instance, a High Court an Administrative Court, and an industrial tribunal. The Bar Association of the Bar of Guadeloupe is also established in the commune. Basse-Terre benefits from the presence of a Chamber of bailiffs, a Chamber of Notaries, and a Chamber of Commerce. The prefecture is also present and the city is the seat of the Urban community of South Basse-Terre. There is a police station and a prison. 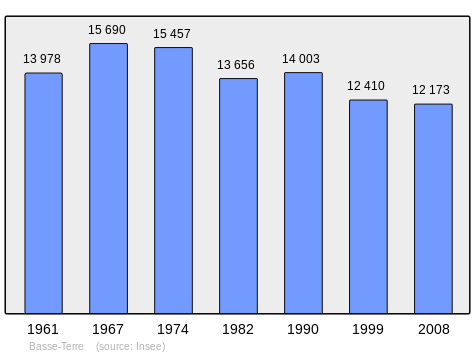 The total number of households in the commune in 2010 was 5158. Since 1982 the population has remained stable. Medical institutions in Basse-Terre are among the largest on the island. In 2012 the hospital in Basse-Terre had 235 beds organized into four areas (emergency, surgery, enlarged internal medicine, obstetrics and pediatrics) and had a staff of 850 doctors, hospital and administrative staff. The commune also has a Health Centre. 360º Panorama of the waterfront of Basse-Terre along the boulevard du Général-de-Gaulle. Over the centuries the commune spread along a street formerly named Grand Rue. The River of Herbs separates two early nuclei of houses which now correspond to the districts of Carmel and Saint Francis. The town developed on a narrow coastal strip between the Caribbean Sea and the first hills of the long mountain ridge that divides the island in two. The volcanic massif of the Soufrière is to the north-east and the mountains of Caraïbes and Houëlmont are to the south-east, which enclose the commune in lush greenery. The city itself stretches over 3 km in spite of a rugged terrain intersected by ravines. The boundaries of the commune have varied over the centuries. The colonial Decree of 20 September 1837 endorsed the creation of communes (endorsed on 12 November 1789) and set the powers of the mayor and city council. The territory of Basse-Terre was previously split into two: intra-muros which was the urban part and its inner periphery and extra-muros that extended to the slopes of the Soufrière (although this terminology is used, the city has never been surrounded by walls). In 1837 two new communes were created by cutting extra-muros from Basse-Terre and the future Saint-Claude and Gourbeyre were created. A decision of the municipal council of 15 March 1839 specified the limits of the commune. By 16 October 1953, the commune has grown and included the neighbourhoods of Rivière-des-Peres by the sea as well as Pintade, Thillac, Morne-à-Vaches, Desmarais, Guillard, and Delille. The total number of dwellings in the commune is 5,540. 82.1% are primary residences against 83% nationally. The number of second homes is estimated at 0.5% and the number of vacancies to 16% which is above the national average of 8%. The area of the commune has been greatly reduced since the end of the 19th century and its mountainous terrain does not allow it to develop large-scale farming. Only the Bologna distillery, a rum producer, remains significant and is one of the jewels of local production shared with the commune of Baillif. The city, as capital of the department, hosts major administration establishments as well as the Chamber of Commerce and Industry of Basse-Terre. 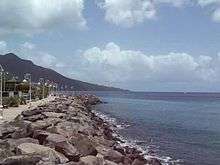 There has been development of the economic sector through improving the reception of cruise ships and passengers in the port of Basse-Terre. The first stone for the ferry terminal was laid on 27 December 2013. The modern terminal has a capacity of 100 people with areas for ticketing and restaurants was opened on 2 October 2015. The unemployment rate in 2012 for the town was 25.6% out of a total workforce of 7,293 individuals. The commune has a very large number of buildings and sites that are registered as historical monuments. For a complete list with links to descriptions (in French) and photos click here. Some of the most interesting are shown below. Fort Delgrès (formerly Fort Saint-Charles), built by Charles Houël in 1649; thereafter many governors expanded it and made substantial changes. It was taken and retaken several times. It had several names: Fort Houël (1650-1794), Fort Matilda by the English (1794), Fort Richepanse (30 March 1803 – 1810), again Fort Matilda (1810-1814 and 1815-1816), again Fort Richepanse (1816-1960), Fort Saint Charles (1960), and Fort Delgrès (since 1989). Classified as an historical monument by order of 21 November 1977. The Gerty Archimede Museum opened in 1984 in the house where the lawyer and politician Gerty Archimede lived. The Courthouse buildings were all built by Ali Tur. It is used for all of the courts of the prefecture including the Court of Appeal and High Court. It is classified as historical monuments by order of 15 December 1997. The Market Clock located inside the City spice Market dates from 1932 and is also the work of architect Ali Tur. The Lycée général et technologique Gerville-Réache was built in the 1st quarter of the 19th century when it housed a military hospital. In the 1950s this was converted into the school. It was classified as an historical monument by order of 15 January 1979. The Regional Council of Guadeloupe was recently built (1991-1993) and houses the offices of regional councilors and the President of the Regional Executive. The General Council of Guadeloupe was built on the site of the former General Council building. It has been listed as an historical monument since 1997. The Prefecture of Guadeloupe on the site of the former military hospital destroyed by fire in 1794. It was a military district which was formerly called the "Barracks of Orleans" in the 19th century. The current building was built by Ali Tur between 1932 and 1935 and was called the "Palace of Orleans" or the "Palace of the Governor". It was not until 1951 that the prefectural administration settled there. It was classified as an historical monument by order of 15 December 1997. The Cathedral of Our Lady of Guadeloupe was built over a wooden chapel that was built in the 18th century when it was called Saint Francis Church. It was not until 1877 that it was dedicated to Our Lady of Guadeloupe. The cathedral was listedas an Historical Monument (MH) on 17 June the 1975. Its annex buildings are the seat of the Diocese of Basse-Terre and Pointe-à-Pitre. The Bell Tower of the Cathedral was built in 1837 and recently renovated recently and is separated on the back of the cathedral without. It was classifiedas an historical monument on 19 May 2006. The Saint Antoine Monastery was founded in 1897 as a charitable hospice and property of the Saint Vincent de Paul congregation. It was listed in 2007 as an historical monument. The TV channel Guadeloupe I and radio Guadeloupe I are available in the commune. Charles Houël du Petit Pré, founder of Basse-Terre in 1649. Jean-Jacques Ambert (1765-1851), General of the armies of the Republic and the Empire, born in Saint-Céré (Lot), died in Basse-Terre. Louis Delgrès, born on 2 August 1766 at Saint-Pierre, Martinique and died on 28 May 1802 at Matouba in Guadeloupe, Guadeloupe hero, Commandant of Basse-Terre in 1802. Antoine Richepanse, born at Metz on 25 March 1770, named chief of the expedition to Guadeloupe by Napoléon Bonaparte, he embarked in 1801 with order to quel the uprising of Louis Delgrès. He succeeded but, having contracted Yellow fever, he died on 3 September 1802 at the age of 32 years at Basse-Terre. He is buried in Fort Delgrès. Ferdinand Joseph L'Herminier, born in 1802 at Basse-Terre and died in 1866 at Pointe-à-Pitre, was a botanist and zoologist. Louisy Mathieu, born on 2 February 1817 at Basse-Terre and died on 4 November 1874. Slave, cooper, and print worker, he was MP for Guadeloupe from 1848 to 1849. Léon Hennique, born at Basse-Terre on 4 November 1850 and died in Paris on 25 December 1935, was a naturalist novelist and playwright. Élie Bloncourt, born at Basse-Terre on 5 May 1896, MP for Aisne and a fervent Resistance fighter during the Second World War. Paul Niger, whose real name was Albert Béville, was a writer, administrator, and militant born on 21 December 1915 at Basse-Terre and died on 22 June 1962 in an air accident at Deshaies. Guy Hatchi, was a former French footballer born on 18 March 1934 at Basse-Terre (Guadeloupe). He played for CS Sedan Ardennes and Olympique Lyonnais. Luc Sonor, born on 15 September 1962 at Basse-Terre, international French footballer, played for AS Monaco and FC Metz and consulted at Canal+. Tanya Saint-Val, singer born in 1965 in the commune. Marie-José Pérec, born at Basse-Terre on 9 May 1968, she was a triple olympic champion: in 1992 at the 1992 Summer Olympics at Barcelona in the 400 metres and twice at the 1996 Summer Olympics in Atlanta in the 400 metres and 200 metres. Jean-Pierre Cyprien, footballer born at Basse-Terre on 12 February 1969, notably won the jersey for Olympique de Marseille. Jane Fostin, born on 27 December 1973 at Basse-Terre, was a Guadeloupean singer and former member of the group Zouk Machine. Rony Martias, born on 4 August 1980 at Basse-Terre, is a racing cyclist. ↑ At the beginning of the 21st century, the methods of identification have been modified by Law No. 2002-276 of 27 February 2002, the so-called "law of local democracy" and in particular Title V "census operations" allows, after a transitional period running from 2004 to 2008, the annual publication of the legal population of the different French administrative districts. For communes with a population greater than 10,000 inhabitants, a sample survey is conducted annually and the entire territory of these communes is taken into account at the end of the period of five years. The first "legal population" after 1999 under this new law came into force on 1 January 2009 and was based on the census of 2006. ↑ "Weatherbase: Historical Weather for Basse-Terre". ↑ List of competent jurisdictions for Basse-Terre, Ministry of Justice website (French). Wikimedia Commons has media related to Basse-Terre.